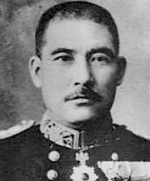 ww2dbaseKichisaburo Nomura was born in Wakayama, Japan. He graduated from the 26th class of the Japanese Naval Academy in 1898. During the Russo-Japanese War, he served aboard cruiser Saien and cruiser Takachiho. In Mar 1908, he served as the naval attaché to Austria. In 1910, he served as the naval attaché to Germany. Returning to Japan in May 1911, he became the executive officer of cruiser Otowa in Sep of the same year. He spent much of the WW1 years in the United States as the naval attaché. He was given his first command, cruiser Yakumo, upon his return to Japan in 1918, but it would be extremely brief as he was almost immediately transferred to the General Staff for post-WW1 conferences. In this role, he was a member of Japan's delegation of the Versailles Peace Conference and then the Washingon Naval Conference of 1921-1922. In the 1920s into the early 1930s, he served a various of staff and sea-going positions, including commanding officer of the 1st Expeditionary Fleet, Vice Chief of the Navy General Staff, commanding officer of Kure Naval District and then Yokosuka Naval District, and others. During the First Battle of Shanghai, he commanded Japanese Army and Navy forces. In this role, he was present at a ceremony in Shanghai in Apr 1932 when a Korean nationalist attacked with a grenade, injuring Nomura's right eye; this injury would blind his right eye for the rest of his life. He was promoted to the rank of full admiral in Mar 1933. From 1933 to 1937, he was the Naval Councilor on the Supreme War Council. Retiring from military service in 1937, he served two years as the principal of the exclusive Gakushuin Peer's school before being made the Foreign Minister under Prime Minister Nobuyuki Abe. 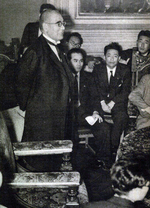 In Nov 1940, Nomura was made the Japanese Ambassador to the United States for his friendly stance toward the Americans. In this role, he repeatedly requested permissions to give in to selected American demands in order to de-escalate tensions, but nearly all of his requests were turned down by his superiors. As Foreign Minister Shigenori Togo lost confidence in Nomura, Togo dispatched Saburo Kurusu to jointly conduct negotiations with the Americans. On 26 Nov, US Secretary of State Cordell Hull presented Nomura and Kurusu with a set of non-negotiable demands for Japan to withdraw all troops from China and to sever relations with Germany and Italy, leading to Tokyo firmly embark on the decision to go to war. This decision was not made known to Nomura and Kurusu, but in the Americans perspective they were considered as deceitful for continuing the discussion all the way through the start of the Pacific War. In the afternoon of 7 Dec 1941, Nomura and Kurusu delivered Japan's declaration of war after the Pearl Harbor attack had already taken place, thus further damaging his standing with his American colleagues. He was interned at Hot Springs, Virginia, United States between Dec 1941 and Jun 1942, at which time he was transported to Mozambique aboard passenger liner Gripsholm. He spotted US Ambassador to Japan Joseph Grew at the docks, who was preparing to board Gripsholm for his return to the United States; the two diplomats (along with Kurusu) removed their hats in mutual respect to each other. Nomura was publicly lauded for his attempts to negotiate with the Americans against all odds, even if he had failed to secure peace. He held no official positions during most of the war years, but continued to hold significant influence. In May 1945, he was appointed to the Privy Council. After the war, he was not prosecuted by the Allied military tribunal, but was interrogated by the United States Navy. The interrogator commented that Nomura was "an extremely capable individual, versed in history and foreign affairs, and apparently completely frank in discussing the past and current troubles in Japan." Nomura later became the President of the Victor Company of Japan (JVC) and then played a role in the country's post-war rearmament. In 1954, he was elected into the House of Councilors. In the late 1950s, he was considered a leading candidate for the position of the head of the Defense Agency, but he declined, noting that the agency should be led by a civilian, and his past military career made him a poor choice. He passed away in the National Tokyo First Hospital in the Shinjuku district of Tokyo, Japan in 1964. He was buried at the temple of Gokokuji in Bunkyo district of Tokyo. 16 Dec 1877 Kichisaburo Nomura was born in Wakayama, Japan. 13 Dec 1898 Kichisaburo Nomura graduated from the Japanese Navy Academy. 12 Jan 1900 Kichisaburo Nomura was promoted to the rank of ensign. 1 Oct 1901 Kichisaburo Nomura was promoted to the rank of lieutenant (jg). 26 Sep 1903 Kichisaburo Nomura was promoted to the rank of lieutenant and was made a navigation officer aboard protected cruiser Saien. 12 Jan 1905 Kichisaburo Nomura was made a navigation officer aboard Keijo Maru. 14 Jun 1905 Kichisaburo Nomura was made a navigation officer aboard protected cruiser Takachiho. 21 Nov 1905 Kichisaburo Nomura was made a navigation instructor. 25 Oct 1906 Kichisaburo Nomura was made a navigation officer aboard protected cruiser Hashidate. 18 Dec 1907 Kichisaburo Nomura was made a navigation officer aboard protected cruiser Chitose. 3 Mar 1908 Kichisaburo Nomura was made a naval attaché to Austria. 25 Sep 1908 Kichisaburo Nomura was promoted to the rank of lieutenant commander. 23 May 1910 Kichisaburo Nomura was made a naval attaché to Germany. 13 Sep 1911 Kichisaburo Nomura was made the executive officer of protected cruiser Otowa. 26 Feb 1913 Kichisaburo Nomura was assigned to Navy Ministry. 1 Dec 1913 Kichisaburo Nomura was promoted to the rank of commander. 11 Feb 1914 Kichisaburo Nomura was made the naval attaché to the United States. 1 Apr 1917 Kichisaburo Nomura was promoted to the rank of captain. 1 Jun 1918 Kichisaburo Nomura stepped down as the naval attaché to the United States. 18 Oct 1918 Kichisaburo Nomura was made the commanding officer of armored cruiser Yakumo. 5 Feb 1919 Kichisaburo Nomura was made a member of the Japanese delegation to Versailles, France. 12 Nov 1919 Kichisaburo Nomura completed his duties as a member of the Japanese delegation to Versailles, France. 17 Aug 1921 Kichisaburo Nomura was made a member of the Japanese delegation for the Washington Naval Conference. 1 Jun 1922 Kichisaburo Nomura was promoted to the rank of rear admiral. 15 Sep 1923 Kichisaburo Nomura was made the commanding officer of 1st Expeditionary Fleet. 18 Sep 1925 Kichisaburo Nomura was made the Director of Education in the Navy Ministry. 26 Jul 1926 Kichisaburo Nomura was attached to the Naval General Staff. 1 Dec 1926 Kichisaburo Nomura was promoted to the rank of vice admiral. 1 Dec 1929 Kichisaburo Nomura was named the commanding officer of the Training Fleet. 11 Jun 1930 Admiral Kichisaburo Nomura was named the commanding officer of Kure Naval District, Japan. 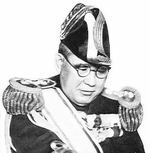 1 Dec 1931 Admiral Kichisaburo Nomura was named the commanding officer of Yokosuka Naval District. 2 Feb 1932 Kichisaburo Nomura was made the commanding officer of 3rd Fleet. 29 Apr 1932 Kichisaburo Nomura was blinded in the right eye by an attack by Korean nationalist Yun Bong-gil at Hongkou Park (now Lu Xun Park) in Shanghai, China. 10 Oct 1932 Admiral Kichisaburo Nomura was named the commanding officer of Yokosuka Naval District. 1 Mar 1933 Kichisaburo Nomura was promoted to the rank of admiral. 15 Nov 1933 Kichisaburo Nomura was made a Naval Councilor on the Supreme War Council. 7 Feb 1934 Kichisaburo Nomura was awarded the Grand Cordon of the Order of the Rising Sun. 29 Apr 1934 Kichisaburo Nomura was awarded the Order of the Golden Kite Second Class. 30 Mar 1937 Kichisaburo Nomura stepped down as a Naval Councilor on the Supreme War Council. 6 Apr 1937 Kichisaburo Nomura was named the principal of Gakushuin school. 25 Sep 1939 Kichisaburo Nomura was named the Foreign Minister in Prime Minister Nobuyuki Abe's cabinet. 16 Jan 1940 Kichisaburo Nomura stepped down as Foreign Minister of Japan. 13 Jul 1940 Kichisaburo Nomura was awarded the Grand Cordon of the Order of the Sacred Treasure. 27 Nov 1940 Kichisaburo Nomura was named the Japanese Ambassador to the United States. 14 Feb 1941 Kichisaburo Nomura presented his credentials to Franklin Roosevelt at the White House, Washington DC, United States. 20 Nov 1941 Japanese ambassador to the US Nomura presented Japan's final proposal to keep peace in Asia and the Pacific. 20 Aug 1942 Kichisaburo Nomura arrived in Japan. 18 May 1944 Kichisaburo Nomura was made a Privy Councillor. 13 Jun 1946 Kichisaburo Nomura stepped down as a Privy Councillor. 24 Mar 1953 Kichisaburo Nomura was named the President of the Victor Company of Japan (JVC). 3 Jun 1954 Kichisaburo Nomura was elected to the the House of Councillors of the Diet. 2 Jun 1959 Kichisaburo Nomura was re-elected to the the House of Councillors of the Diet. 8 May 1964 Kichisaburo Nomura passed away at the National Tokyo First Hospital in Tokyo, Japan. 8 May 1964 Kichisaburo Nomura was posthumously awarded the Grand Cordon of the Order of the Paulownia Flowers. Does anyone know what his opinions were on World War 2? of course it is the usual wikipedia b-sh@t. both men knew well in advance. decryption problems? give me a break!!! !